MAYNARD, MA--(Marketwired - Mar 24, 2014) - Kaon Interactive, a leading provider of interactive 3D product marketing applications, today announced the launch of the world's only cloud-based digital marketing platform that enables B2B marketing and sales enablement applications to be created once and delivered anywhere, at any time, and on any device, without re-development fees. 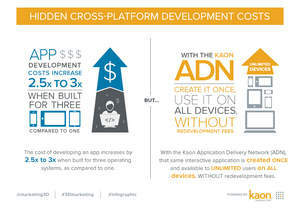 The new Kaon Application Delivery Network (ADN) eliminates the hidden costs of re-creating and maintaining interactive 3D product applications on multiple platforms, ensuring that these engaging experiences ALWAYS work and are delivered into the hands of prospects, customers, sales teams, channel partners and marketing professionals, regardless of their geography or device. Industry research has shown that the development costs for a typical B2B interactive mobile application is between $50,000 and $250,000, depending on the complexity of the application, and costs increase 3x when supporting up to three devices. Less obvious is the required maintenance expense of a B2B application, which averages 2.5x the initial development cost, over a two-year period. "While many marketers often budget for the initial development of the application, they often don't consider the hidden costs associated with maintenance due to platform/browser and operating system upgrades and bug fixes," said Gavin Finn, president and CEO of Kaon Interactive. "In 2013 alone, there were dozens of upgrades and bug fixes to iOS and Android operating systems, impacting many B2B applications. This is one of the reasons that 25% of B2B business apps are deleted after their first use, and that after only 90 days just 35% of the typical B2B app's users are still active. The Kaon ADN is not only changing the way interactive product content can be used (by anyone, at anytime and always up to date) but it also ensures that the initial marketing investment is leveraged across operating system platforms, without additional fees to support incremental operating system updates or bug fixes." "From the management of the interactive application, to getting it into the right people's hands, the Kaon ADN is a true game changer," said Mark Tarantelli, Global Director of Sales Enablement Tools at Schneider Electric's IT Business. "Everything is automated, alleviating device compatibility issues and extending our reach across the globe to everyone who needs it. It has truly made my life a lot easier." With the Kaon ADN, marketers are able to eliminate the need to migrate or re-create interactive content when moving from one operating system or browser to another, better leveraging their initial investment. The Kaon ADN enables a "create once, use everywhere" approach to interactive 3D product applications. This allows for applications to be re-used across all devices, saving marketers significant re-creation costs and reducing time to market. Kaon's innovative database-driven design provides companies with the unique capability to create multiple language translations within the same application, and quickly and cost effectively deliver international versions of their applications. The Kaon ADN now allows a company's marketing, sales, customers, and partners quick and easy access to interactive 3D product applications via the Kaon Share Card. Applications are continuously updated to support new operating systems, devices and web browsers, ensuring that the application will ALWAYS work. Kaon's 3D Product Models, interactive solution stories and collateral are updated without a trip to the app store. Users interact with the most relevant digital products, messaging and content every time. Using the Kaon Share Card, marketers can easily and quickly share their interactive application on all platforms (i.e. Android, iOS, Kindle, Mac/Windows laptop/desktop, web) from one universal URL. The Kaon Share Card recognizes the user's device and geography and directs them to the appropriate iTunes App Store, the Google Play Marketplace, the Chrome Web Store or to launch the application directly within their modern web browser. By clicking on the social media buttons within the Kaon Share Card, companies can post social media links that drive people directly to their interactive applications, or to specific sections within the applications, such as a particular 3D Product Model. The Kaon ADN includes powerful analytics for measuring all aspects of user engagement and real insight into the effectiveness of 3D Product Models and interactive storytelling applications. Analytics are tracked both online and offline across all devices, allowing marketers to understand how frequently people use their applications, what sections they experience, and what content is of interest to them. This insight gives marketers actionable tools to refine their messages. Kaon's award winning interactive 3D product marketing applications seamlessly weave together compelling virtual 3D Product Models (which look and behave exactly like the actual products), 3D virtual environments, panoramas, flow diagrams, videos, embedded marketing collateral, and presentations in a branded digital environment. The self-driven, non-linear user engagement results in a personalized experience every time, creating a relevant transfer of knowledge to each individual within the buying cycle. When deployed on the Kaon ADN, these engaging demonstrations of complex products and solutions become immediately accessible to everyone, on the device most relevant to them -- including tablets, web browsers, laptops, desktops, phones, and Kaon v-OSK® MT™ touch screen appliances. Kaon Interactive is a leading developer of interactive 3D product marketing applications. Founded in 1996, the company helps B2B marketers and salespeople consistently demonstrate and differentiate products anywhere anytime and turn prospects into customers. Kaon's interactive 3D Product Models transform product marketing content into visual product storytelling experiences to deepen customer engagement, reduce marketing expenses and accelerate the sales cycle. More than 4,000 Kaon interactive applications are being used worldwide at trade shows, remote sales demonstrations, product launches, executive briefing centers, and websites by leading global product manufacturing companies including Cisco, Ortho Clinical Diagnostics, Schneider Electric, Ciena, IBM, EMC, BD, GE, Waters and Oracle. To experience a demonstration and learn more about Kaon, visit www.kaon.com or call us at 978-344-4106. Copyright (c) 2000-2013 Kaon Interactive, Inc. All rights reserved. All other trademarks are the property of their respective owners.